Phil Snider is an award-winning author, pastor, public theologian, and teacher. His work has been featured in the Huffington Post, Religion Dispatches, Slate, USA Today, and numerous other local and national media outlets, including NPR affiliates and nationally-syndicated radio and television programming. He is perhaps best known for his speech on equal rights for LGBTQ+ persons, which has been viewed on YouTube over five million times. 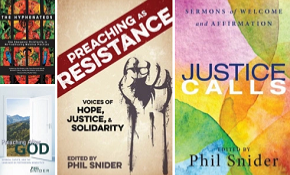 Phil’s books (as author or editor) include Preaching as Resistance, Justice Calls, Preaching After God, The Hyphenateds, and, with Emily Bowen-Marler, Toward a Hopeful Future (winner of the 2011 Mayflower Award for best book in church and society). Additional forthcoming titles include two volumes (edited with Katharine Sarah Moody) for the series Intersections: Theology and the Church in a World Come of Age. Phil is a pastor at Brentwood Christian Church in Springfield, MO, and he teaches religion at Missouri State University and Drury University. Phil did his undergraduate work at Missouri State University (Springfield, MO), then earned his M.Div. at Phillips Theological Seminary (Tulsa, OK) and D.Min. at Chicago Theological Seminary (at the University of Chicago). He also holds a certificate in pastoral care and counseling from Forest Institute of Professional Psychology. Phil has served in various leadership capacities in the Springfield community, including President of the Drury University Board of the School of Religion, representative leader to the Springfield Interfaith Alliance, member of the Diversity and Inclusion Advisory Council at Missouri State University, founding member of the Center for Diversity and Reconciliation at Brentwood Christian Church (now known as the Springfield Area Coalition for Responsibility, Equity and Dignity, or SACRED), founding member of the Greater Springfield Race and Faith Collaborative, co-chair of the Springfield chapter of the NAACP Religious Affairs Commission, president of the Springfield Ministerial Alliance, and chair of the leadership table for Faith Voices of Southwest Missouri, which is dedicated to promoting economic dignity and race equity for all Missourians. He was also the co-founder (with Katharine Sarah Moody) of the Subverting the Norm conference series, at Drury University.